Pictured is a rendering of the master plan for the Coughlin’s Crossing development being built on the city’s southeast side. Plans for the first building scheduled to be built, Blue Sky Car Wash, was presented to the Delaware Planning Commission on Wednesday for an informal review. If approved by the city, the car wash would be built in the area marked “Lot 2” on the eastern portion of the development (shown to the north in the rendering). The development is surrounded by U.S. Route 23 to the west, Stratford Road to the east, and Meeker Way to the south. Progress is finally taking place with the much-anticipated Coughlin’s Crossing development located between U.S. Route 23 and Stratford Road, north of Meeker Way. Last week, Delaware Development Plan Ltd. held a meeting with residents to provide an update on where that progress stands and to add some insight on what is to come. 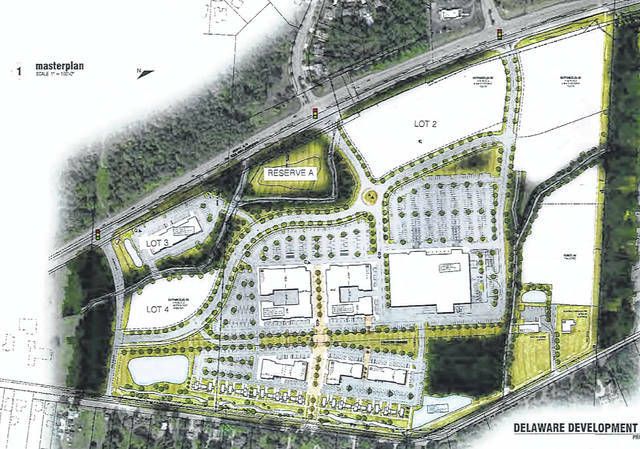 On Wednesday, Connie Klema, principal of Delaware Development Plan, was before the Delaware Planning Commission to discuss the updates with the city. Klema told the commission the cold and wet weather in the winter and spring led to delays in beginning construction, but she said it is moving along quickly after finally getting underway. She added they are through most of what she called the “war days,” referring to the initial site development stage. “I’m very excited, more excited than I was before because it is finally time to start going vertical and start making it pretty again,” Klema said. In addition to presenting an update of the potential layout for the site, Klema was joined by representatives of Blue Sky Car Wash, who will represent the first business to build in Coughlin’s Crossing. While a car wash might not move the needle for those who have been awaiting — with excitement or disdain — an announcement on businesses coming to the site, it had to start somewhere. “I don’t think anyone anticipated a car wash being the first use out of the gate, so to speak, on this site, but something has to be first,” said Planning and Community Development Director Dave Efland. Efland said Blue Sky had been looking into a Delaware location for some time, and they were very good to work with in meeting the city’s design requirements, which stray far away from the typical design of the car wash.
“This is not going to look like the Blue Sky Car Wash on U.S. Route 23 in Orange Township … Basically, it is using the materials and the specs that are to be used in the rest of the center,” said Steve Martin, the attorney representing Blue Sky. Barry Nutter, a Blue Sky partner who owns the locations in Lewis Center and Powell, said the tunnel for the wash, alone, would be about 110 feet. He added a typical accessory car wash, such as one attached to a gas station, is around 50 feet. Overall, the footprint of the car wash will be 5,500 square feet. Nutter said a Blue Sky Car Wash can clean 175 cars per hour with the new system, which he also said does not exist in any other car wash in the state except for a couple in the Cleveland area. Being the discussion was only a conceptual review before the commission, no vote was required. The proposed development plan will come back for final approval at a future meeting.